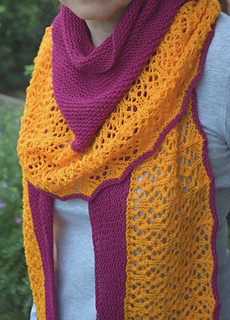 Catcher of Dreams is a crescent shaped shawl that forms a comfortable balance between lace and garter stitch. 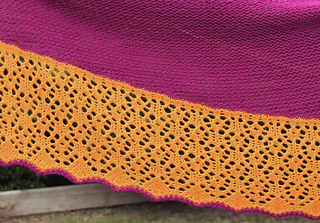 Incorporating a highlighted scalloped edge that both complements and completes the design, it is worked from the bottom up with easy short rows to create the shape. 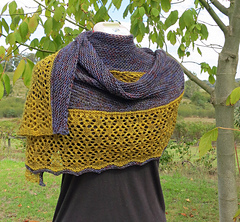 Please note: While gauge isn’t crucial for this shawl, the finished size will be affected by any differences. 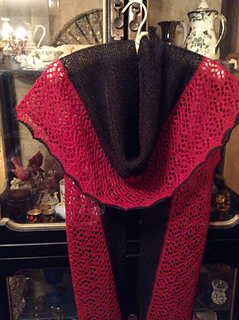 Measurements taken after blocking, when shawl has relaxed. Sample shown in Wollmeise 80/20 Twin Sock yarn (80% merino, 20% nylon, 466 m / 510 yds per 150g skein) MC: Fuschia, CC: Kuken.